Achieve a classically handsome look that will have everyone envious wearing the RAYMOND WEIL® Maestro watch. Round stainless steel rose gold-tone case. Softly textured blue leather bracelet with contrast tonal stitching. Fold-over clasp with double push button safety closure. 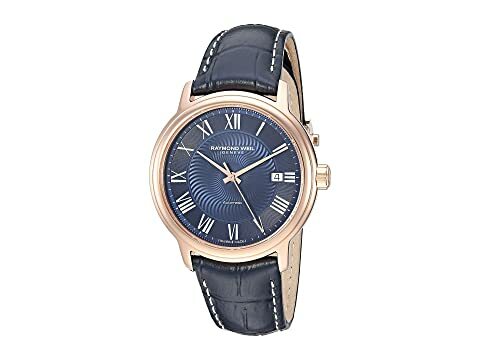 Dark blue dial face features Roman numerals, rose gold-tone hands, date display window at 3 o'clock, and minute track at perimeter. We can't currently find any similar items for the Maestro - 2237-PC5-00508 by RAYMOND WEIL. Sorry!